Being a person of colour in the world today is having to constantly affirm your place in society. It's about having to defend your right to exist, to work twice as hard to prove yourself, and to forever be up against people who view you as a threat or an inconvenience. Being a person of colour who refuses to be seen in this way is aggressive, problematic or 'obsessed with race'. These are just some of the labels that Reni Eddo-Lodge seeks to probe and dismantle in Why I'm No Longer Talking to White People About Race, a seething take-down of commonly held attitudes towards race and racism in the UK and beyond. 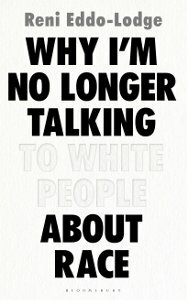 The title may be provocative but it is entirely essential, symbolising an intense frustration with the way that people of colour are continually dismissed by those that refuse to accept the reality of structural racism. Eddo-Lodge's insightful discussions on black history from Britain's colonial past to the murder of Stephen Lawrence and, more recently, Brexit, reveal a deep-seated, institutional hatred of 'the other', which has continued to inform and affect opinions today. Her bold choice to include an interview with former BNP leader Nick Griffin underlines this, proving that such attitudes will persist as long there is a resistance to change. As she regretfully explains, 'Britain's relationship with race and racism isn't a neat narrative with a feel-good resolution'. Nevertheless, by exploring sources of racism, whether it be through historical analysis or by delving deeper into white feminism or the link between race and class, Eddo-Lodge reveals why anti-racist work should be a universal objective, even if racism isn't a universal concern. The book is ultimately a defiance against the silencing of people of colour, with Eddo-Lodge working to remind us of civil rights activist Audre Lorde's words: 'your silence will not protect you'. Out now, published by Bloomsbury.